Another from the Assumption College production line, Ben Dixon is originally from Yarrawonga and was drafted in 1994 with the 77th pick in the National Draft. A hard-at-it forward, Dixon has the ability to play small or tall, and also has the occasional burst in the midfield. 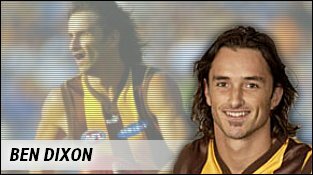 Dixon is probably best remembered for his after the siren goal in 2001 against Carlton to ensure a memorable victory. Has constant ankle and knee problems, and there is also a query on his consistency. Every year seems to be make-or-break, but he always seems to do enough. Struggled for most of 2004 with a knee injury, but needs to seriously lift else 2005 may be his last season at Glenferrie.